Early fall is consistently the time of the year that we receive the most requests for remedies to deer damage on tree trunks. Damage is caused as male deer rub their antlers on tree bark, typically to remove the “velvet” fuzz that is no longer needed on the mature antlers. As a result, deer often rub their antlers aggressively on young trees. 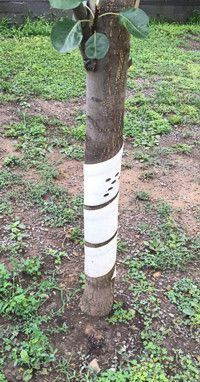 Bark is often severely damaged and splintered. Also, low reaching tree branches can often be cracked or mangled as well. If damage is severe enough, trees (young ones especially) will die from this sort of damage. Before damage is made, we encourage you to protect your trees, especially the younger ones and especially so if your yard is frequented by deer. So what can you do to protect your trees from damage? We sell lots of plastic “shields” that wrap around tree trunks to impede aggressive deer. They are available in two styles, the first is a panel that wraps around and locks into itself. The other is a spring shaped wrap that coils around a tree trunk and grabs to it tight. (shown here to the right). Similar to the concept of plastic shields would be the use of chicken wire. Simply grab a roll of chicken wire and wrap the mesh around the trees of concern. The chicken wire will be unappealing to deer and prevent them from targeting the protected trees. You could consider building a 7 foot tall fence around the trees or around your lawn in its entirety, but this is often a menacing task, so it is not a very popular one. Or you could use concentrated deer repellents. Something like our Shake Away hanging deer repellent bags are a good product for this purpose since they are long lasting and hang off the exact trees that you are looking to protect. Our granular Deer Scram would be a good one as well, since you could sprinkle this product heavily around the base of the tree. The all natural Deer Scram will not harm other plants, but the scent will scare deer area from the area. If your tree does experience damage, the best thing that you can do is to clean up the edges that have been splintered and shattered, and protect the tree in one of these methods to prevent further damage. The tree will naturally heal itself over time. Thanks so much for reading. If there is a topic that you would like us to provide more information on, please feel free to write to us through our contact us form on our website!